Hi friend! I hope you’re having a fabulous week! I feel like I’ve been working non-stop the last few weeks and I’m starting to feel a little tired. Luckily I’ve got a nice relaxing weekend planned and I’ve been keeping up with my batch-cooking and meal prepping magic to keep my healthy eating on track, even when I have very little time! So far I’ve whipped up my favourite Cabbage Roll Soup, some GF almond bread, lots of chicken thighs, and I always make sure I have cleaned and prepped veggies in the fridge to throw together a quick side. Since this week I’m taking part in a No-Sugar Challenge, meal prep is even more important to make sure I don’t cave in and eat a million treats due to ravenous hunger and ill-preparedness. This week’s recipe fits the bill handily! Not only is it sugar free, it makes a big batch that you can freeze or keep in the fridge for a quick and easy protein source. They’re packed with quinoa and lentils for a complete source of plant protein and the spices and herbs are totally customizable based on personal preference. I think they taste absolutely killed with my Avocado Ginger Lime Dressing, but you can use anything from Glory Bowl Dressing to Baba Ganoush or a Greek Yogurt Dip. Get creative and customize to your own tastes. 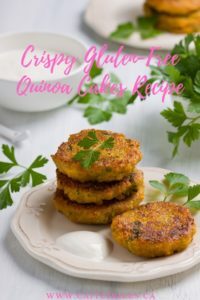 These protein-packed quinoa cakes are the perfect option for a hearty, nourishing, and delicious vegetarian meal! Preheat oven to 400F and line a large baking sheet with parchment. Cook the quinoa with water and a pinch of sea salt. Bring to a boil then reduce to a simmer for 15-20 minutes. Do not remove the lid while simmering. Once 15 minutes is up fluff with a fork and let cool. Cook the split peas with water and a pinch of sea salt. Bring to a boil and then simmer until soft. Strain and set aside. Combine quinoa, lentils, egg, green onions, tahini, mustard, and spices together. Form into small patties and place on baking sheet. Bake for 15 minutes then flip over and bake another 10-15 minutes until crisped on the outside. Serve with dipping sauce of choice such as this delicious Avocado Ginger Lime recipe! Well friend, I hope you enjoy your grounding and hearty recipe for this week. And remember, if you need any extra support to help you feel strong and healthy, make sure you download my FREE Anti-Inflammatory Meal Plan & Shopping List right here!